You’ve asked for it, and we’ve brought it back. We’re starting off June with a 75/50/25 sale. From June 1-3 you’ll save a whopping 75% off the price of solar panel glass. That brings the individual panel price down to as low as $5! For more information on what solar panel glass is and how you can use it, check out this blog post. That same weekend, save 50% off your fan purchase to help beat the heat, and light your back deck with 25% off lighting. Start your garage organization project the right way with 20% off cabinets and 25% off cabinet sets from June 15-17. 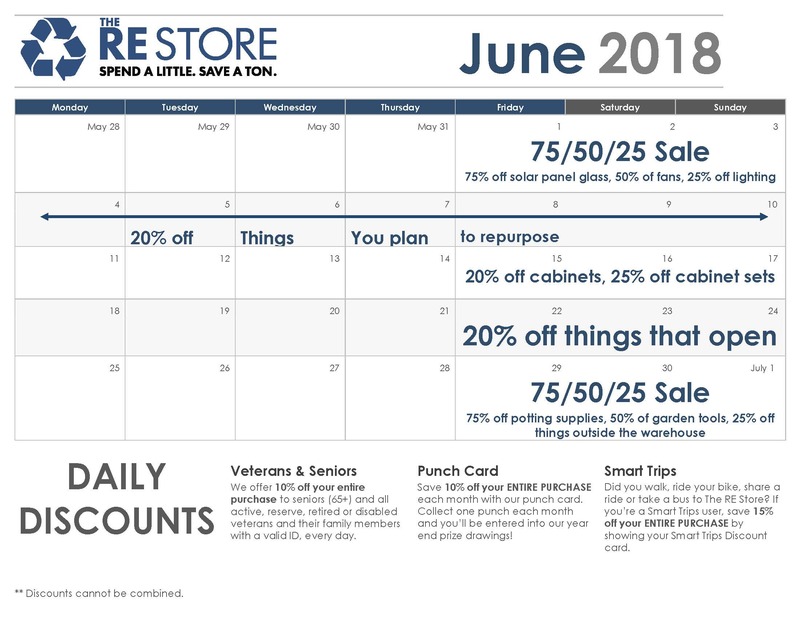 June 22-24 will save you 20% on your purchase of things that open. That’s doors, cabinets, lockers, and more. If it opens, you get 20% off. From June 29 – July 1, save in the garden department. 75% off potting supplies, 50% off garden tools, and 25% off items outside of the warehouse.